cover artwork 2005 Kurt Ozinga. When a laboratory technician on the verge of retirement accidentally infects himself with blood from an emergency room patient, he intends to report it-- until government agents swarm the hospital, confiscating every sample of blood taken from the patient--at gunpoint. Deciding not to report the incident just yet for fear of being thrown into an isolation chamber, he goes home--and falls violently ill. By the time he recovers and returns to work, scary things are happening. To Lida Quillen. Thanks for all the support and help. It could have happened to anyone. I just happened to be on duty in the lab that night when the accident victim came in. "Laboratory. Mister Brandon speaking," I said, very correctly, when the phone rang; I already guessed what it would be. Most calls to the lab at that time of night were from either the emergency room or the intensive care unit and I had been to intensive care already, just a few minutes ago. The blood from that patient was already in the chemistry unit, being analyzed. It was the Emergency Room. I picked up the tray containing all the phlebotomy supplies by its handle, automatically checking to be sure I had enough of everything; needles, vacutainers, syringes for hard to get veins, special needles for the syringes, alcohol sponges, cotton balls, band-aids and so forth. Everything was there, as I knew it would be. Checking the phlebotomy tray was always the first thing I did when coming on duty; that and getting a fresh pot of coffee going. I'm a caffeine addict. Most small hospitals try to have the lab and X-Ray departments close to the emergency room but with Lamont Memorial in Lufkin, that wasn't the case. The building had grown in fits and starts as medical care changed and technology advanced. The lab was up on the second floor and down a long hall from the elevators. Most of the time I didn't wait on the elevators; I was getting old and needed to exercise. Taking the stairs when I got called was one way of getting it. "Hi Mike," Sandy Jervis, the charge nurse said. "Room one." "Thanks," I told her, not bothering to ask what the problem was. It really didn't matter to me. As long as I had been in the game, I had seen it all. Or thought I had. The patient was lightly strapped to the gurney, with the ER doc and another nurse busy working on him. Carla, one of the nursing students, handed me the lab request forms. I glanced at them, then at the patient, and wondered what they wanted me for. The man on the gurney looked as if he were already dead. His face had that whitish gray pallor of death and I couldn't see his chest moving. His clothes had been cut away and a bloody sheet was pulled back up onto his chest, showing a massive trauma to both of his legs, as if he had been run over by a vehicle. The doc and nurse both had blood on them, a no-good way to be working in this day of AIDS, hepatitis, avian pneumonitis and God knows what else the terrorists might be cooking up. The wounds had stopped bleeding and simply gaped open. I could see both the tibia and fibula, the lower leg bones of one of his legs. Both were shattered like someone had gone in with a big nutcracker and purposely crushed them. "Is he still with us?" I asked. "Barely," the doc said, then looked puzzled. "It's not typical shock trauma, but damned if I can find anything else wrong besides his legs. Witnesses said it was a high speed vehicle accident." I didn't know the doctor's name. The hospital used contract docs for the ER and they came and went oftener than new Medicare regulations. Looking at the patient, I doubted there was much blood pressure and figured his veins would be hard to get into. I decided to go with a 20 cc syringe and 21 gauge needle rather than vacutainers or a butterfly. Hardly any of the younger techs even know how to use a syringe, but I think I mentioned earlier that I wasn't a youngster, not by a good many years. The patient's vein popped up when I put the tourniquet around his arm, much more visible than I had expected. I had just gotten all the blood I needed and withdrawn the needle when the patient gave a sudden spasm. Both of his arms jerked upward at the same time as his feet began thrashing, as if he wanted to run somewhere. It's a good thing that the leg with the broken bones had the air cast to keep it stable or the sharp ends of the shattered bones might have slashed an arterybut I wasn't noticing that. His forearm hit my hand where I was still holding a piece of gauze on the puncture site and knocked it up into my other hand, the one holding the syringe of blood. I felt the prick of the needle entering my wrist. "Oh Goddamn!" I cursed loudly, jerking my hand away. The needle pulled out of my wrist but it was already too late, of course. If the patient had an infectious disease that could be transferred by blood, I probably had it now, too. I had been holding the damn syringe at just the right angle for the force of the patient's arm to make me press on the syringe plunger, injecting a bit of his blood into my system. The doc and the nurse were busy trying to keep the patient from falling off the gurney and at the same time were tightening the air cast on the broken leg. They couldn't spare me a glance and I knew they were assuming my curse was simply a reaction to the sudden movement of the patient. It had been a long night. I was tired and my feet were hurting and I didn't feel like filling out an incident report with all the time and paperwork it would entail. Besides, paperwork wouldn't do me a damn bit of good if I had caught something. I quickly transferred aliquots of blood to three different vacutainers, then removed the needle from the syringe, all the while concealing the dot of red on my wrist where the needle had hit me. I dropped the used needle into the disposal box, stripped off the disposable gloves and got out of there, still cursing, but silently. It had been a long while since I had gotten stuck by a contaminated needle, but it certainly wasn't the first time. That sort of thing is an occupational hazard for a lab tech, and a very dangerous one in this day and age when all kinds of deadly diseases keep popping up. But I'm a fatalist; I figured if I had caught anything, filling out an incident form wasn't going to make it go away. Later on I could run some tests on myself and see whether I had lucked out againor hit the bad end of the jackpot. Back in the lab, I set up the runs for a blood count and a chemistry panel on the patient with two of the tubes of blood, dropped one in a rack to begin cross-matching some blood for him and set the last one, the spare, in a rack in the back of the big refrigerator. The panel would take a while, but the blood count was finished in only a minute or two, a far cry from the old days when I was a youngster. Back then, while labs already had instruments that did the numerical count of red and white blood cells, the techs had to stain a slide and examine it under a high power microscope to differentiate the white blood cells into separate categories that told the doctor whether and what type of disease might be present. That was hardly ever done these days except when the instrument gave odd results. Like right then. The blood analyzer dinged and flashed a light at me while it printed out the results. Not to get technical, but the counts were all screwed up, red and white blood cells alike. None of it made sense to the electronic sensors. They didn't make sense to me, either. Either a cold agglutinin or advanced leukemia of some sort was my first thought. I glanced at my watch. It was almost time for the morning shift to begin showing up, but I still had time to make a slide and take a gander at what the blood looked like to the human eye. I began the preparations and that's when all the weirdness started. I heard the entrance door swing open and almost immediately there was a shout. "Stand where you are! Don't move!" I moved, of course. When I turned around there was the ER doc, being shepherded by two grim looking men in suits. One of them wore a thin little mustache that didn't match the shade of his blond hair. The other was dark colored and had black, swept back hair. Both were wearing suits but what they also had in common was a scared but determined look on their faces. "Where's the blood? We want it, right now!" I had no idea what in hell was going on, but the muzzle of the gun one of the men was pointing at me got my attention quicker than seeing one of the nurses walk in naked would have. "What blood?" I asked, rather inanely, then said a little more forcefully. "Who the hell are you, anyway?" "Are you Michael Brandon? The lab tech?" The guy with the gun asked. "That's him," the other one said after glancing at the name tag on my jacket. He was gripping the upper arm of the doc with a pressure so tight I could almost feel the pressure. The doc grimaced but made no attempt to get loose; his eyes were wide and scared looking and he was trembling like a whipped dog. For all my bravado, I probably didn't look much better. "The blood, mister. We want that blood you just drew in the Emergency room." "Give it to them!" The doc said. "They're from the government." His voice trembled, matching the quiver of his body. I didn't see what that had to do with it, not then, but I wasn't going to argue with a gun. "It's in the rack there," I told them, pointing to the rack by the blood counting instrument. Still keeping me covered with his weapon, the putative government agent strode over and plucked the tube of blood from the rack. He checked the name on it and dropped it into his pocket. "Is that all?" I walked over to the chemistry analyzer and gave him that tube of blood, too. "What's wrong? Does that patient have some bad disease?" I was remembering the needle sticking me in the wrist and felt my heart skip a beat. "None of your business," the one holding the doc said. He turned to his companion. "We'll have to have these machines sequestered as a precaution. Get the results, too." I didn't wait. I picked up the card with the weird results from the counter where I had dropped it and handed it to the armed man. Just then, the chemistry run printed out and I gave him that report, too. I also asked again, "What's wrong with that patient?" "He's a terrorist," said other agent or whatever he was, the one holding the doc. "That's all you need to know." That was enough. If the injured man was a terrorist, and given those badly abnormal results, along with the totally paranoid actions of the government men, it followed that he must be infected with some communicable disease and intended to spread it as far and wide as possible. I felt my heart jump again when I reached that conclusion, knowing that whatever he had, it was almost certainly a very bad bugand now I probably had it, too. Alien Infection Copyright © 2005. Darrell Bain. All rights reserved by the author. Please do not copy without permission. At Lamont Memorial in Lufkin, Texas the night shift ER Doc asks Lab Technician Michael Brandon to draw blood for tests from a patient seemingly dead. As he fills three tubes up, the barely alive patient knocks the syringe into Michael’s wrist though neither of the medical attendees notice because they are distracted by the movement. Not much later, as Michael tests two of the tubes of blood and refrigerates the third, two suits with guns arrive taking the two tubes, but quickly leave as the comatose patient has some how escaped. Michael goes home, but becomes very ill. A few days later he recovers only to learn that anyone involved with that patient is being eliminated in what has been made to look like accidents as the ER Doc and nurse died while allegedly running away together. Realizing the Feds will come for him and how diabolical these suits are, Michael heads to Dallas where he meets Mona to get his ID changed. He cuts himself shaving, but panics when she touches his bleeding nick with a finger she had accidentally stuck with a pin. She becomes infected. As they flee together, each notices they seem younger and healthier while the Feds hunt them now in Arkansas. This medical thriller grips the audience from the moment that Michael is jabbed by the syringe and never slows down as he and Mona struggle with learning the truth and surviving the ordeal of the Feds wanting them dead in what appears to be a clean-up cover-up operation. Michael and Mona are interesting protagonists, but what hooks readers is the need to know even with the obvious title what infects the heroes and why the Feds want to eradicate the evidence. 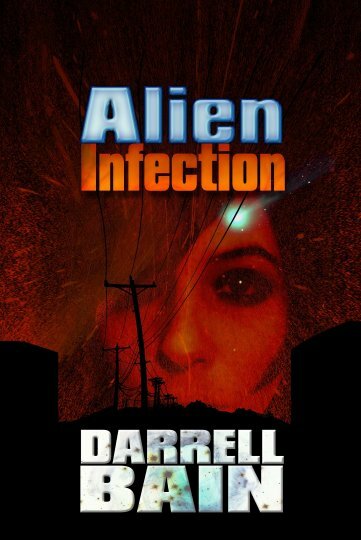 ALIEN INFECTION is a fine science fiction suspense thriller that the X-Files crowd will enjoy. Reviewed by Harriet Klausner for Midwest Book Review Bookwatch. Cover design 2005 Kurt Ozinga. All rights reserved.